Colette Auclair, author of 2012 Golden Heart finalist Thrown, was kind enough to stop by and chat with us about how fate works in unexpected ways (and how sometimes that makes you a train writer!). 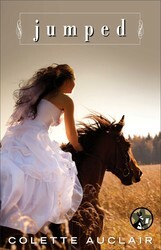 Check out Jumped–the steamy follow-up to her “page-turning debut” (Library Journal). Now on-sale! About a year ago, I got laid off. But it was okay, because I had a novel to finish—JUMPED, which came out on Monday and BRANDED after that (coming in December), and between the severance package and savings, I’d get by. I pretended I was either making a fine living writing, or was an heiress. It worked for a while. I am good at delusional thinking. When my debut novel THROWN was published in December 2013, I had a plan. My book was going to teeter at the tippy-top of all bestseller lists. 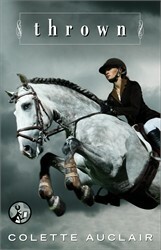 With its lovely gray jumping-horse cover, it would wow reviewers and break records. I would be an overnight sensation. I would know this because Oprah was going to call. The cliché, “If you want something done, give it to a busy person” seems to hold up. I’m a copywriter and a novelist. Tastes great/Less filling. Like legions of other authors who must write in their spare time, I hope this day job is the last one I’ll ever have, because soon I’ll simply be a novelist. Who writes on trains, apparently. As a public service, I will warn the driving public in your town. PWD does not only stand for Portuguese Water Dog, but Plotting While Driving. The car is the perfect place to plot, isn’t it? I also work out dialogue as I drive, which is uneventful unless I have the windows open–then it’s simply more interesting for others at red lights. So that’s how you do it! Loved Thrown. Looking forward to Jumped. Thanks, Pamela! Yes, that’s how I do it, or at least how I’ve done it for about a month. I wasn’t sure I could concentrate, but I get on at the first stop, and so can always get a seat. So if my characters start riding trains, you’ll know why. I hope you enjoy JUMPED. I’m now retired, but when working I got an hour for lunch. I packed a lunch every day, sat in my car, ate and wrote. I always took along the last couple paragraphs, which helped my focus. I wrote in longhand on a clipboard. I’m also a firm believer in “you can write anywhere.” Our brains are capable of tuning everything out and writing. We just have to practice. Professional athletes can tune out 20,000 screaming fans and make the shot/basket/pass, etc., performing at their peak. We can train ourselves to shut out distractions and write. Like you do on the train. I think the key is believing you can do it. Too many writers believe they can’t be productive while eating lunch/waiting to pick up the kids/sitting at the kids’ swim meet, etc. So glad you did it successfully, Colette. JUMPED and THROWN are great books. I’ve read and loved them both! I love writing in anonymous spaces, like airports, hotel rooms, and even airplanes. For some reason, I get more done when I’m traveling than when I’m at home. It might have something to do with the absence of dogs and dirty dishes.